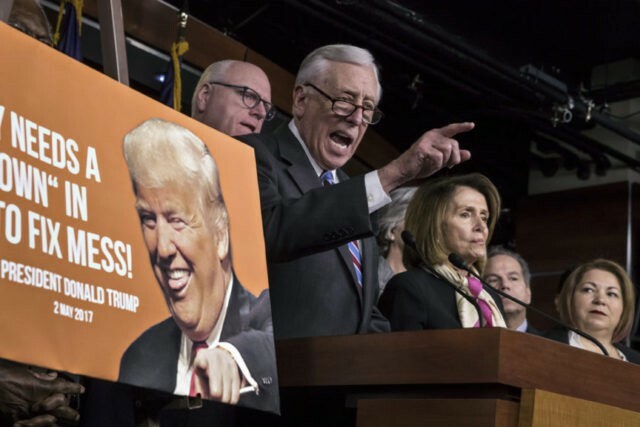 WASHINGTON (AP) — Hours after shuttering much of the federal government, feuding Democrats and Republicans in Congress spent Saturday dodging blame for a paralyzing standoff over immigration and showed few signs of progress on negotiations needed to end it. The finger-pointing played out in rare weekend proceedings in both the House and Senate, where lawmakers were eager to show voters they were actively working for a solution — or at least actively making their case why the other party was at fault. The scene highlighted the high political stakes for both parties in an election-year shutdown whose consequences were far from clear. “The American people cannot begin to understand why the Senate Democratic leader thinks the entire government should be shut down until he gets his way on illegal immigration,” said Senate Majority Leader Mitch McConnell, R-Ky., hours after a last-chance Senate vote failed. Democrats refused to provide the votes needed to reopen the government until they strike a deal with President Donald Trump protecting young immigrants from deportation, providing disaster relief and boosting spending for opioid treatment and other domestic programs. The fighting followed a late-night vote in which Senate Democrats blocked a House-passed measure that would have kept agencies functioning for four weeks. Republicans began the day hopeful they might pick off Democratic support for a three-week version and bring the episode to a quick end. Those hopes faded fast, as Democratic continued to insist on an alternative lasting only several days. Trump worked the phones, staying in touch with McConnell, while White House legislative affairs director Marc Short and budget chief Mick Mulvaney met at the Capitol with House Republicans. GOP lawmakers voiced support for the White House stance of not negotiating while the government was shuttered. While Republicans blamed the breakdown on Schumer, Democrats increasingly focused their messaging on criticizing Trump, whose popularity is dismal. Democrats were using his zigzagging stance in immigration talks — first encouraging deals, then rejecting them — to underscore his first, chaotic year in office. Republicans seemed content to hope additional Democrats will break as pressure builds and the impact of the shutdown becomes clearer. In the late-night vote blocking the bill preventing a shutdown, five Democrats from states Trump won in the 2016 election voted to keep government functioning. Republicans argued that Democrats were blocking extra Pentagon funds by keeping government closed and thwarting a long-term budget deal. But pressure on Republicans could mount with the new workweek Monday and the impact of the federal shutdown becomes more apparent to people. While the Statue of Liberty — the nation’s emblem of its immigrant past — and Philadelphia’s Liberty Bell were closed Saturday, visitors had access to other iconic national parks like Yellowstone. Interior Secretary Ryan Zinke tweeted a photo of himself talking to students at the World War II Memorial in Washington, blocks from White House. Which party’s strategy would succeed remained open to debate. Retired Sen. Judd Gregg, R-N.H., a veteran of shutdown wars, said he believed Democrats believe “the more chaos they can create the better.” He said Schumer’s tough strategy was “a gross overplaying of his hand” and predicted Democrats would eventually relent. Former Rep. Nick Rahall, D-W.Va., said both parties needed to be cautious. Democrats have been seeking a deal to protect so-called Dreamers. Around 700,000 of them have been shielded against deportation by the Deferred Action for Childhood Arrivals program, or DACA, which Trump halted last year. He’s given lawmakers until early March to pass legislation restoring the protections, but he’s demanded added money for his proposed border wall with Mexico as a price.